Mature student status is meant to allow individuals the opportunity to demonstrate academic potential by other than strictly academic means. For instance, you might lack the academic preparation but have acquired several years' of life and work experience demonstrating your potential to successfully complete university-level study. Many applicants mistakenly believe that the "mature student" category can substitute for a poor academic record. This is not true. Have demonstrated potential for success through academic, professional or volunteer activities and other accomplishments. You must also meet Faculty-specific admission requirements since some programs have additional or supplementary requirements for admission. Applicants to programs in the Lassonde School of Engineering, Faculty of Science or Nursing must have completed any required math or science courses within the last five years. Make sure you know what the deadlines are for applying. Make sure you submit all required documentation. If you have a diagnosed physical, learning or mental health disability, you may want to request modified admission consideration. * Meeting the mature student criteria will not guarantee you admission to the University. We review each applicant on an individual basis. Senior citizens who wish to be admitted to the University (as candidates in a degree program or as visiting students) are evaluated as mature students unless they have completed previous post-secondary studies (see the appropriate sections above). In order to be eligible for a domestic tuition fee waiver, applicants must be Canadian citizens/permanent residents and 60 years of age or older by May 1 for the summer session or September 1 for the fall/winter session. The fee waiver is capped for senior citizens to the level of tuition fees assigned to domestic, non-professional undergraduate arts, science and other programs as defined in the tuition fee guidelines from the Ministry of Training, Colleges and Universities. The tuition fee waiver for an eligible senior citizen is restricted to a maximum of one undergraduate and graduate degree. Eligible senior citizen tuition waiver students are required to pay all other fees attached to a course or program, or required during the process of registration (including centrally collected ancillary fees, fees approved by student referenda, material fees, financial penalties etc.). 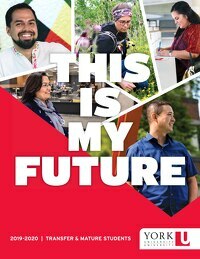 Please contact Registrarial Services or visit sfs.yorku.ca/fees/waivers for additional information.